Reliance Jio Lyf Water 1, The killer smartphone in mid-range price launched in India priced at Rs. 14,999 which will be available for sale from early feb. 2016 through Reliance Digital in White colour option. Reliance also launched Reliance Jio Lyf Earth 1 priced at Rs. 23,990 and Reliance Jio Lyf Water 2 at Rs. 14,690. It will counter Xiaomi, Lenovo, Samsung and Intex in mid-range market. 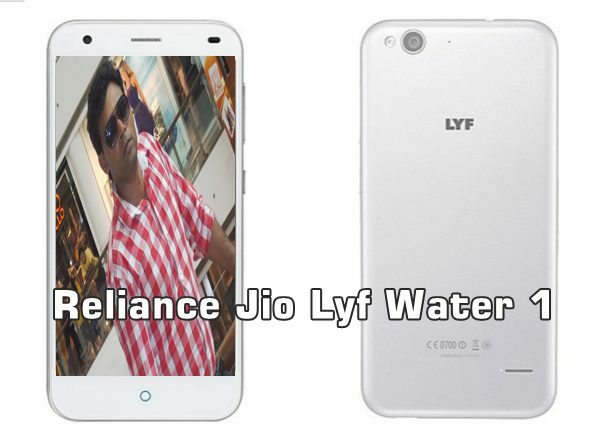 The all new Reliance Jio Lyf Water 1 supports Dual-SIM, 4G LTE, 3G, 2G, Bluetooth, Wi-fi, USB. It sport a 5-inch full-HD (1080×1920 pixels) Amoled display with a resolutio with pixel density of 401ppi perfect for multitasking. Reliance Jio Lyf Water 1 coming to revolutionize your multitasking because it’s powered by a 64-Bit octa-core Qualcomm Snapdragon 615 SoC clocked at 1.5GHz, with Adreno 405 GPU will run on Google’s latest OS Android 5.1.1 Lollipop including 2GB RAM+16GB ROM+ 32GB MicroSD card slot. Reliance Jio Lyf Water 1 also sporting a 13-MP rear camera with Dual-LED Flash including a 5-MP front facing camera for selfie and video calling. It also packed with a 2600 mAh battery measures 154×76.6×7.7mm and weight 122gm. At last I would like to say that Reliance Jio Lyf Water 1 coming to please the Indians. What you think? Please be open to give your view.